Chick-fil-A is introducing a new spicy chicken biscuit and you can try it for free! 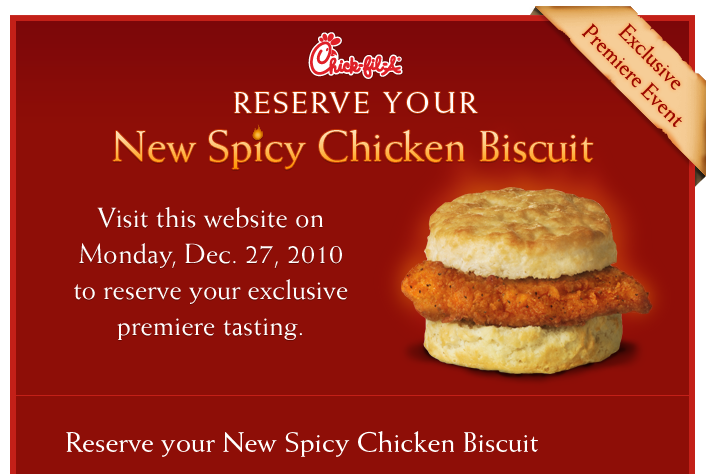 From January 3 – 8, 2011, participating Chick-fil-A Restaurants will give out a limited number of FREE Spicy Chicken Biscuits to customers who make a reservation. On Monday, Dec. 27th, rsvp at your preferred Chick-fil-A Restaurant location. (I’ll remind you Monday if you follow Southern Savers on Facebook or Twitter).